The sun rose as usual on this shining, sparkling pre-Xmas summer morning. A nice day for an apocalypse*. And where better to face the end of the world than on a (mostly) deserted Aussie beach, in an inadvertent echo of Australian classic On the Beach? A disturbing vision of post-apocalyptic dystopia, Australian author Nevil Shute’s masterpiece** was adapted for a 1959 film*** graphically showing the utter hopelessness following a nuclear holocaust. I’d actually forgotten that the 21st December 2012 was to be, according to some, the end of the world. But even if I HAD remembered, I’d still have chosen to go to the beach. But not just ANY old beach. This beach. The Southern Yorke Peninsula’s Swimmers Beach – at least we THINK that’s what it’s called – almost as far south as you can go in South Australia. And as the apocalypse drew nigh, Swimmers Beach was enjoying a summer’s day of such brightness and clarity the end of the world seemed very far away. It wasn’t just the end of the world, however, but also a hot summer’s day, the Australian summer school holidays AND only a few days before Christmas. So sharing the pristine sands and unbelievably clear waters of a beach several hundred metres long with only five other people was a little surprising. While Swimmers Beach provides a convincing argument against the best and clearest ocean waters only being found between the tropics of Cancer and Capricorn, that isn’t its only attraction. The natural limestone amphitheatre rising above the sand, continually eroded by the treacherous seas that have scuttled several ships over the years, is an endlessly fascinating work-in-progress. Today, a jagged tumble of rocks – newly fallen if the colour and lack of plant life is any indication – create an awesome backdrop for the arching sky above. Elsewhere, rocky edges are softened by the green vegetation and wildflowers bloom among the rocks. And the wooden staircase hugs the cliff as it climbs to the cars parked high above. Adventurous drivers on the road above the cliff top have no concept of how closely it nudges the edge – with an ever-increasing undercut adding an element of potential danger. Only a small danger in the context of the end of the world, however!! Our footprints the only ones to mark the vast expanse of white sand once past the beach’s other occupants as we wandered to the end and back, the salt water cold despite the summer heat. We could have been the last people on earth. But unlike what faced the hapless characters of On the Beach, there appeared to be no apocalypse in sight today … YET! Just another deserted Aussie beach. And us. * According to some, the world was to end on this day! ** Argue if you dare! « The Ghoulish Guide of Cutta Cutta Caves! @George – Yes – but it’d be a bit hard to have a full on Xmas feast!!! @Val – Movies about depressing subjects are ultimately more satisfying – don’t you agree?!?! @Alessandra – Hope it’s a good Xmas for you – look forward to the pix! @River – just look out for the sharks!!! 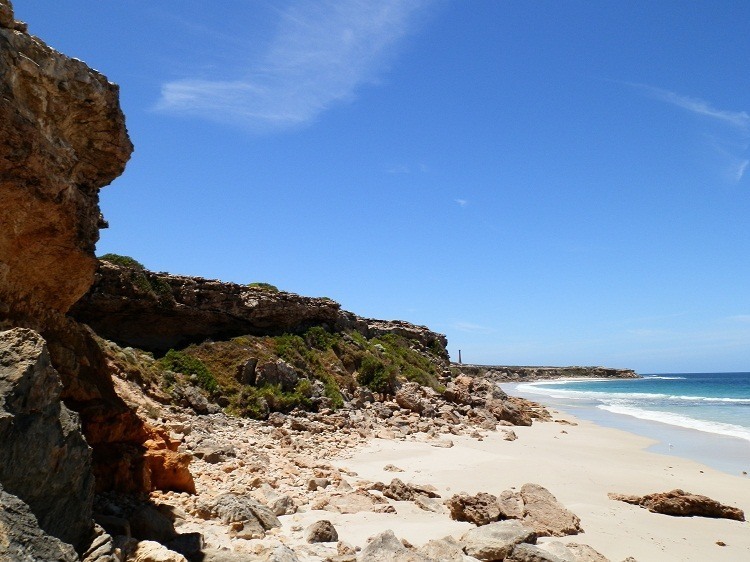 @Jill – There’s quite a few west-facing beaches in SA as well with killer sunsets! And I’m SO with you on the beach-at-any-time thing! @Pia – Glad I could share some Xmas sun! @PDP – And now we get to see it post-apocalypse! @Are We There Yet – as I would in winter!!! @Tri-Girl – Aren’t we all, darling?!?!?! @Beach Bum – I thought this would lure you back … MC2U2!!! Beautiful pictures. I have to say…. I would have a hard time adjusting to Christmas in the summer. Here Christmas it is usually snowing and blowing. How does Santa come to see you?? He must have wheels on that sleigh of his. Good that there was no apocalypse and I could come and see this beautiful photos today! I love walking on deserted beaches anytime of year. In winter I love the wild wind and the waves crashing, but not the sand whipping! And of course in West Oz the sunsets are amazing! 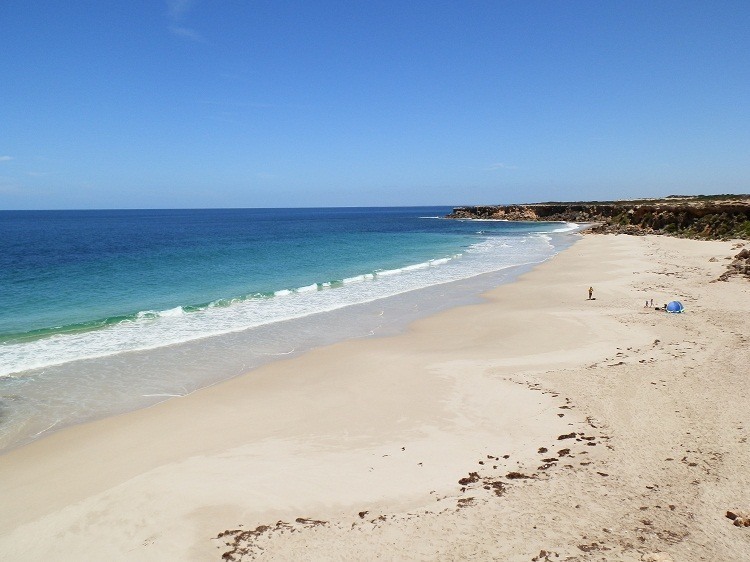 I will have to check out this beach next year when we go to South Oz. Wishing you and yours a safe and joyous Christmas. Very poetic post Red..gorgeous images, not a bad spot to be at the END OF DAYS haha! I loved that movie. Which sounds odd, with it being such a depressing subject. I came across it flipping channels, and was hooked. Then I had to go to the library and get the book. What a wonderful place to be, even if the world did not end as predicted. I would love to spend Christmas on that beautiful beach. There’s that stairway! Now I know where it is. I see a bus trip in my future. 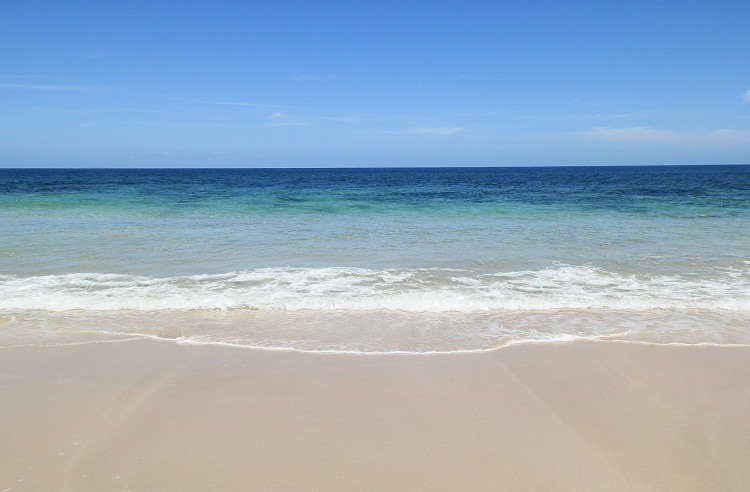 I want to climb down to that wonderful white sand and wet my feet in the ocean. This year my Xmas in NZ will be not by the sea but in the mountains by the lake, a bit different, but a spectacular place, possibly one of the best in NZ. Ciao and have a great Xmas! Just a great beach with white sand. Enough is enough. As I edge deeper into a depression brought on by the grey, miserable skies and seemingly constant rain it did feel like the end was nigh. But there you are on the other side of the world, stealing the blue sky from the rest of us with no-one else in sight on that glorious sandy beach. Please don’t expect me to feel sorry for you because you won’t have a white Christmas at least you will have a hot one. We’re in for a wet one!And I don’t mean the alcoholic type although that might be one answer. Get that bottle open now! @Linley – And they’re almost scarily easy to find down here!! @Saucy Kod – Just watch out for the sharks … will be at home for Xmas, then who knows where? Stay tuned – and enjoy your end of year break!!! @Mary – Hahaha, you got that right!! @Filip – Not too far removed from the Caribbean, right?!?! @Manzanita – Hey, great word! I’ll have to start using it … I and my little point & click camera thank you for your kind words – I’d rather enjoy myself than be weighed down by masses of fancy camera equipment! @Windsmoke – The end of the world was so NOT in my mind, I didn’t think of it until later in the day! @Robert Geiss – I hoped the photos would brighten your day!! @TMWH – Couldn’t have planned it better if I’d tried!! Wonderful way to greet the end of the world, I say! What a dream ! Getting windy and cold over here. Thank you for this escape. Please have a good Sunday. Bonza photos. A most pleasant spot to spend your last days on this planet which in my mind i knew would be a total fizzer anyway. Hey Red, Your beach photos are jazzed. I really don’t know that word but my kids used to use it when something was good. But….. my favorite is the one looking up at the steps. Your camera must be super great. I can see the grain of all the wood. I love pictures like that ….. so real you could walk into them and get slivers from the wood. May your Christmas be bright and shiny and salty from your beaches. That is the staircase most people need to climb(like 45 times) after Christmas dinner. I just love the solitude of a deserted beach. @Joan Elizabeth – The trick is to get REALLY hot first – then the cold water isn’t so much of a shock!! @eileeninmd – We’ll never have a white Xmas and you’ll never have a hot one – maybe we should swap over one day & have a change!! @Andrew – And what better time for it!! Not quite sure what the end of the world passing me by actually says about me!!! How typically Australian. While the world is supposedly ending, you swan around the sands of a near perfect beach. Beautiful beach scenes. I wish I could be at a warm beach on Christmas! It will be very cold here next week. Lovely photos. Have a Happy Christmas! It looks gorgeous but I was pretty sure the water would be cold … as far as I am concerned any water south of qld is too cold to swim in.